CHARLESTON, SC (February 10, 2015) – Hanahan residents looking for a stunning home in a great location will soon enjoy David Weekley homes in Timbercrest Village at Tanner Plantation! The community will open in the first quarter of 2015 with homes priced from the high $200s. Homebuyers will enjoy shopping, local restaurants, childcare and a gym at nearby Tanner Station shopping plaza, and convenience to I-526 and I-26, and the Charleston International Airport. Timbercrest Village is located close to Wannamaker Park, a county park with playgrounds, walking trails and a water park. Residents can also boat on the nearby Goose Creek Reservoir with a boat launch just down the road. Opening soon is The Brooklands model home, a two-story home with four bedrooms, four full baths and one half bath. The Brooklands boasts 2,930 square feet of living space and features a keeping room off the family room, and an upstairs retreat area. David Weekley homes in the Charleston area are energy-efficient, EnergySaver™ homes backed by the Environments For Living® Program’s heating and cooling energy usage guarantee. Homebuyers may choose from thousands of Custom Choices™ in the Charleston design center to personalize their David Weekley home. The nation’s largest privately-held home builder currently builds single-family homes in Charleston, Goose Creek, Hanahan, Mount Pleasant and Moncks Corner. 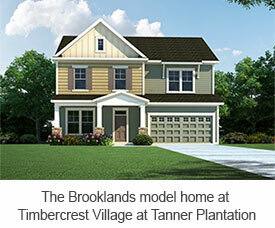 For more information about Timbercrest Village at Tanner Plantation, call Kelly Maloney at 800-399-7079.